Do you need first aid, CPR, food safety or AED certification for school or workplace requirements? Do you want to learn the latest ILCOR and American Heart Association standards in CPR at the lowest prices? 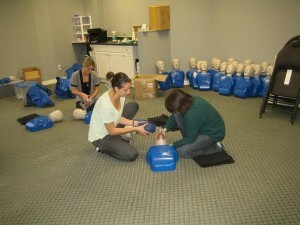 Register for CPR and workplace safety training with Saskatoon First Aid. This provider offers the most competitive rates, highest volumes of courses and most experienced instructors. Learn basic life support, advanced first aid, CPR for health care providers, infant CPR or register for comprehensive training with standard first aid. Re-certifications, private training and on-line safety courses are also available. Use the contact information below to register for a course or to inquire about the CPR training available to you in Saskatoon. You can reach Saskatoon First Aid with the contact information below. Send an e-mail, give a telephone call, or walk-in during business hours in any of Saskatoon First Aid’s numerous training centers if you want to enroll for a course or inquire about booking private classes. An on-line registration form is also available on the Saskatoon First Aid website linked below. Customer service representatives are available from 8 am to 7 pm to help answer your questions or to help with registration. They are knowledgeable, friendly and can help with all your registration needs. What Are the Popular CPR Courses Available? CPR level ‘A’ – this is the most basic course that teaches participants rescue techniques for adult victims only. This course requires approximately 4 hours to complete. No re-certifications are available for this course. CPR level ‘C’ – this is the most comprehensive “lay rescuer” CPR course. This level teaches participants about rescue techniques for adult, child and infant victims. It requires approximately 5 hours to complete. Re-certifications are available for this level. CPR level ‘HCP’ – this level, also referred to as CPR level ‘C’ for health care providers, is one of the most comprehensive level’s available. It is designed for health care providers and requires approximately 6 hours to complete. Participants will learn advanced CPR rescue techniques using trained assistance and the use of equipment such as bag-valve masks. HIV causes a condition known as AIDS that damages our immune system. Without the immune system functioning properly, our body is exposed to different microorganisms that can cause disease. Participants enrolled in CPR training in Saskatoon will learn about effective disease prevention techniques when providing CPR. These techniques will help prevent the spread of diseases such as HIV / AIDS.